Linn launches new Exaktboxes, expands Exakt support for third-party speakers | What Hi-Fi? Linn has been busy developing three new Exaktboxes and has also expanded support for third-party speakers. It’s a big day for Linn news. Having just unveiled its new Series 5 systems, Linn has gone on to show off three more new products and announced increased support for popular third-party speakers. The new products centre around Linn's Exakt technology, "the most direct connection that's ever been made between the artist and the listener." Exakt keeps your music in the digital domain for as long as possible, to avoid any degradation caused by signal processing, and takes care of the digital-to-analogue conversion itself. It aims to eliminate magnitude and phase distortions caused by the crossover, drive units and enclosure. We begin with a new Akurate Exaktbox, which brings an Exakt upgrade to all of Linn's legacy loudspeakers, and lets other manufacturers' speakers benefit from Exakt optimisation. This new, simplified version of the Akurate Exaktbox has six digital-to-analogue converters. Like the Klimax Exaktbox, the six-way Akurate Exaktbox can be run in stereo mode, where a single Exaktbox targets a pair of three-way speakers, or deliver higher performance in dual mono mode where the entire processing of each Exaktbox is dedicated to a single speaker. It's a step down from the first Akurate Exaktbox, which had ten outputs for up to 5-way speakers. It’s yours for £3500. MORE: Linn Klimax Exakt puts "the source in the speaker"
Next up is the Exaktbox Sub. This is designed to work with all subwoofers and integrate them with Exakt systems. 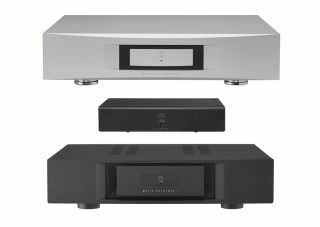 Linn says it can target any subwoofer by simply adjusting the subwoofer gain to blend in with the speakers. It enables a linear phase response down to 0Hz, promising no phase distortion at roll-on/roll-off frequencies. It also enables Space Optimisation+ adjustment dedicated to the subwoofer, which removes unwanted distortions caused by the room. It houses two channels of Akurate Exakt crossover and digital-to-analogue conversion, along with RCA and XLR outputs. It costs £1250. Finally, the Majik Exaktbox-I. This is the latest Exakt product in Linn’s Majik range. It has all the capabilities of an Exaktbox, but adds power amplification. It has a full Exakt engine plus eight channels of digital-to-analogue conversion, with 100W of amplification per channel. Linn calls it a ‘one-box, first-step upgrade to Exakt’. There are enough channels to target any current or historic Linn speaker up to a four-way configuration, as well as any model with Exakt support. How much? £3950. All three boxes are available from today. Linn has also expanded Exakt support for more third party speakers: the KEF Reference 5, the PMC Twenty.26 and the JBL K2 S9900. These speakers can be "upgraded" (Linn's words, not ours) with a reversible operation that bypasses the speaker’s passive crossover. An Exakt conversion kit is attached to the end of the speakers, to be connected to an Akurate Exaktbox, which performs the crossover digitally. Exakt technology then aims to eliminate distortion, corrects for drive unit variation, and optimises the in-room performance. Previously, Linn had performed this operation on the B&W 802 Diamonds.